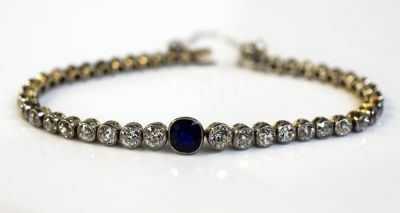 A beautiful Edwardian platinum and 14kt white gold mill grain bracelet featuring 1 cushion mixed cut medium dark blue sapphire, est. 1.64ct and 42 old European cut diamonds, est. 7.43ct (VVs2-I1 clarity & F-I colour). It has an hour glass safety and an attached safety chain. It is approx. 7 inches (17.78cm) in length.